Free and open web app to track real-time messages, pictures, and locations from social media (Twitter) for disaster response and assistance efforts. The Center for Human Dynamics in the Mobile Age (HDMA) at San Diego State University developed a web-based social media mapping application, called “GeoViewer”, which can visualize the location-based social media (Twitter) in various cities and locations. 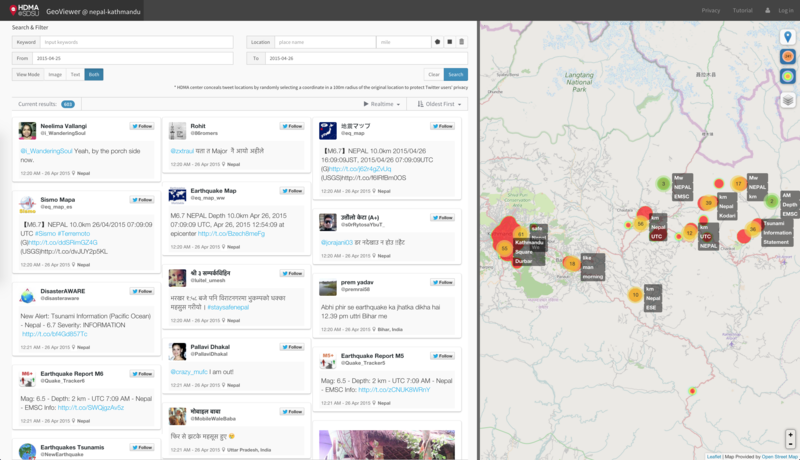 This tool has collected real-time location-based tweets in Nepal and nearby areas since April 25, 2015. Users can search for the most recent tweets or historical tweets (since 4/25) by using keywords, spatial boundaries, or time. The mapping functions include hot spots, cluster maps, two base maps (OpenStreetMap and ESRI Satellite imagery layers) with adjustable transparency settings. The GeoViewer [Geo-targeted Event Observation (GEO) Viewer] has been developed mainly by Dr. Calvin Jung (Chief Data Scientist at HDMA center) with the founding support from National Science Foundation (Award# 1416509 and #1028177), San Diego State University, and the collaboration with the County of San Diego, Office of Emergency Services (contact: Robert Barreras). Please use the GeoViewer and give us feedback about how to improve the tool for the future disaster response and assistance.